Top Treasures PROP MONEY Real Looking Copy 100s FULL PRINT Stack - Total $10,000 for Movie, TV, Videos, Advertising & Novelty (100) by Top Treasures at HoldUp Art. MPN: 123mone. Hurry! Limited time offer. Offer valid only while supplies last. CINEMA QUALITY - Prop money is used for major cinema films. The quality and resemblance of the money is made to look like the real thing! Get your hands on the same money that the professionals have! DOUBLE-SIDED - This play money is double-sided and life size. Refer to images for quality. PREMIUM INK - We don't skimp on quality. 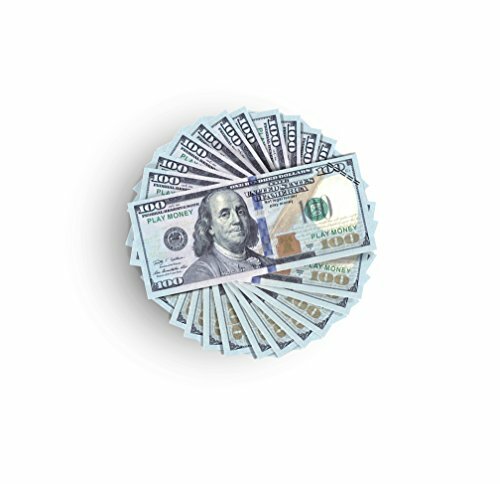 Each bill is printed on high quality paper and ink. Each bill lacks no defects. And is made to look like the real thing. KIDS FRIENDLY - While this is made for the pros in the movies this is also a great teaching tool. The play money is great to use with any money games you can think of! OUR PROMISE: 100% MONEY-BACK. At Top Treasures customer satisfaction is our #1 priority. Top Treasures provides a no-questions-asked, no hassle guarantee. If for any reason our prop money is not what you wanted, just message us for a full refund. If you don't love this set we'll give you every cent back. So you'll either LOVE your new set, or it's free. Your trust and business just means that much to us. If you have any questions about this product by Top Treasures, contact us by completing and submitting the form below. If you are looking for a specif part number, please include it with your message.